The Sphynx cat is a breed of cat known for its lack of fur. The skin should have the texture of chamois, as it has fine hairs. Whiskers may be present, either whole or broken, or may be entirely absent. They can come in all different colours and patterns, including white, black, red, chocolate, lavender, tabby patterns, tortoiseshell calico and pointed. Whichever colour their skin is, it resembles the colour their fur would be if they had fur. The skin on a sphinx cat has to be kept moisturized with a gentle, scent-free lotion or oil, and they have to be bathed once a week. 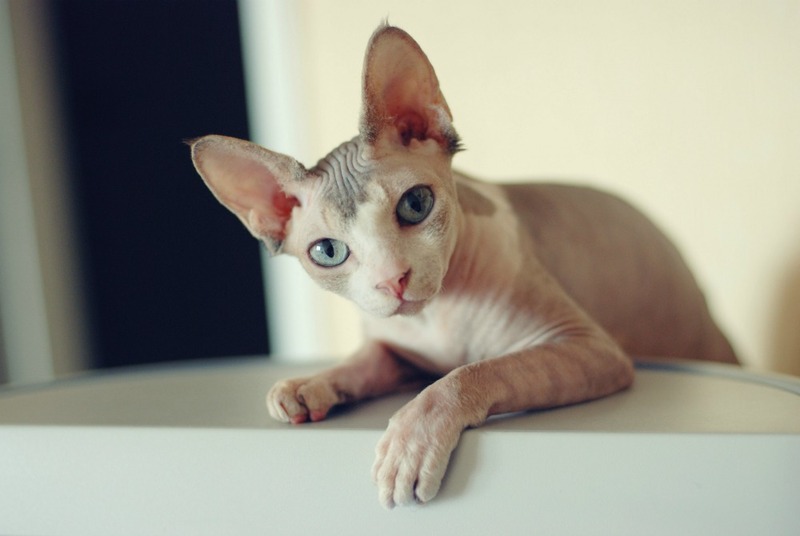 With the lack of fur, the sphynx will need sweaters to keep them warm. If you feel cold at all, know that your Sphynx cat is cold too. Even though they will feel warm to the touch, that does not mean they are warm. The Sphynx cat loves attention. They are good therapy cats as they are very fond of meeting people. When not receiving attention, the sphynx can be found exploring their surroundings and climbing to seek high places. They are incredibly fond of puzzle toys and challenges. The Sphynx cat may be hairless, but they are not hypoallergenic. Due to the fact they still produce dander, dead skin cells. There is no scientific evidence that any breed is less allergenic than any other cat.